In the March issue of Nature Climate Change, IRI Director Lisa Goddard explains what may be behind the recent slowdown in global temperature growth in a piece titled “Heat Hide and Seek”. The Earth Institute’s Kim Martineau interviewed Goddard for some additional thoughts. We include the original Q&A here along with additional resources. Q: Is there a global warming ‘hiatus’? Yes and no. In the past 15 years, surface temperatures have not warmed as quickly as they did during the 1980s and 1990s. The surface of the planet is where we live and have amassed the best climate measurements and so it tends to be where we pay most attention. However, the planet is a big place. Global warming affects many parts of the climate system, and the accumulated energy in the climate system due to man-made global warming is going mostly into the oceans. The oceans are still warming at the rate we would expect from increasing greenhouse gasses. However, natural variations in climate can affect where heat is stored in the oceans over years to decades. Q: How do El Niño and La Niña figure in? Q: What other ocean-temperature cycles affect climate? The Pacific Decadal Oscillation (PDO) and Interdecadal Pacific Oscillation (IPO), which are related to El Niño and La Niña events, also influence global temperatures and how much heat gets stored in the upper ocean. Lasting one or more decades, these cycles operate on longer timescales than the two to seven-year El Niño-La Niña cycle. Q: Our last strong El Niño was 1997-1998, with several researchers predicting another big one soon. What is the IRI’s forecast? 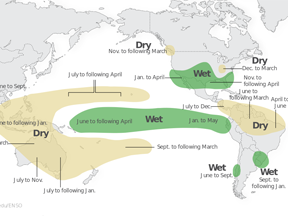 We are forecasting an increased likelihood of an El Niño this year. As indicated by real-time measurements at sea and El Niño prediction models, the odds are twice as good as you might expect from past El Niño frequency alone. It is too difficult at this time of year to predict whether such an El Niño might be large or moderate. Q: Will we see a sudden jump in surface temperatures when this next El Niño arrives? Changes in global temperature usually lag the development of a mature El Niño by several months. El Niño events usually peak at year end, so if a respectably-sized El Niño developed, we would expect to see its imprint on global temperatures in the early months of next year. Q: Are there any current, credible projections of what temperatures will do in the next 3-5-10 years? It depends if you want the local temperature or the global average, or the average for the next decade, or the temperature in 2024. The physics of planetary energy balance under increasing greenhouse gasses will lead to warmer global temperatures. Again, even with the current slowdown in the warming rate, the last decade has been warmer than the decade before. However, on shorter timescales and in particular regions, climate variability can be more pronounced. We are good at predicting climate from season-to-season and year-to-year, particularly for temperatures. But climate predictions several years to a decade out are still experimental. This is the problem we are working on now.